For the Irish cricketer, see Jennifer Gray (cricketer). Jennifer Grey was born on March 26, 1960 in Manhattan, the daughter of stage and Academy Award-winning screen actor Joel Grey and former actress/singer Jo Wilder (née Brower). Her paternal grandfather was comedian and musician Mickey Katz. Grey's parents both came from Jewish families. Grey is an alumna of the Dalton School, a private school in Manhattan where she studied dance and acting, and where she met her best friend, actress Tracy Pollan. After graduating in 1978, Grey enrolled at Manhattan's Neighborhood Playhouse School of the Theatre for two years of training as an actress. While waiting for roles, she supported herself waitressing. Grey's commercial debut was at the age of 19, in an ad for Dr Pepper before making her film debut in Reckless (1984), in a small role. She appeared in a small role in Francis Ford Coppola's The Cotton Club (1984). That year she starred in the war film Red Dawn. She then appeared in the 1985 John Badham project American Flyers. In 1986 she played the role of jealous sister Jeanie Bueller in the John Hughes comedy film Ferris Bueller's Day Off, opposite Matthew Broderick. The film was commercially successful and received a positive critical reception. The following year, she reunited with Patrick Swayze, opposite whom she had played in Red Dawn, to play Frances "Baby" Houseman in Dirty Dancing. The story is a coming of age drama that documents a teenage girl's rebellion against her father by starting a relationship with a dance instructor during the family's summer vacation. The low-budget film was a surprise hit, the first film to sell one million copies on video, and is considered a classic. The film also defined Grey's career, and she was nominated for a Golden Globe for Best Actress for the role. Grey's sole Broadway theatre credit is her 1993 appearance in The Twilight of the Golds. In the early 1990s, Grey underwent two rhinoplasty procedures—the second of which was necessary to correct problems stemming from the first—that resulted in a nose that caused even close friends to fail to recognize her, and the major change in her appearance negatively affected her career. Of the experience she said, "I went in the operating room a celebrity—and came out anonymous. It was like being in a witness protection program or being invisible." She briefly considered changing her name in order to start her career anew, but ultimately decided against this. From March 1999 until January 2000, Grey starred as herself in the short-lived ABC sitcom It's Like, You Know..., which satirized her much-publicized nose job as a running gag. Grey appeared with Shirley MacLaine, Liza Minnelli, and Kathy Bates in the CBS television movie The West Side Waltz, adapted by Ernest Thompson from his play. She appeared in one episode of Friends as Mindy, a high school friend of Jennifer Aniston's character Rachel. She had a small role in the 2000 film Bounce with Gwyneth Paltrow and Ben Affleck. In 2007, Grey portrayed Daphne on the HBO series John from Cincinnati. In 2010, she played Abbey, the mother of a sick child in the season seven House episode "Unplanned Parenthood". Grey was a contestant on season eleven of Dancing With the Stars. She was partnered with professional dancer Derek Hough. She came out very strong at first, frequently topping the leaderboard. However, injuries, stress, and exhaustion took their toll on Grey, and for a couple of weeks she fell behind. In week seven, however, she improved, tying with previous frontrunner Brandy Norwood. On November 23, 2010, Grey and her partner Hough won the competition. In September 2011 Grey appeared in the Lifetime movie Bling Ring as Iris Garvey, the mother of Zack Garvey. On November 5 and 6, 2011, Grey stood in for head judge Len Goodman on the BBC One TV show Strictly Come Dancing. Grey voiced Mrs. Kurokawa in the English dub version of Hayao Miyazaki's film, The Wind Rises. From 2014 to 2017, Grey portrayed Judy Meyers on Red Oaks. In 2018, Grey co-starred in the film Untogether; the film was released on February 8, 2019. 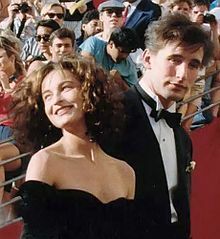 On August 5, 1987, Grey suffered severe whiplash in a car accident in Enniskillen, Northern Ireland, while vacationing with actor Matthew Broderick, whom she began dating in semi-secrecy during the filming of Ferris Bueller's Day Off. The accident, which was the event through which their relationship became public, occurred when Broderick, at the wheel of a rented BMW, crossed into the wrong lane and collided head-on with a Volvo driven by a local mother and daughter, Margaret Doherty, 63, and Anna Gallagher, 28, who were killed instantly in the accident. Broderick was later convicted of careless driving and fined $175. Dirty Dancing was released a few weeks after the accident, catapulting Grey to fame, but she has said that her grief and survivor's guilt over the crash prevented her from enjoying the film's success, and led her to withdraw from acting for some time. Grey was also romantically involved with actors Michael J. Fox and Johnny Depp and journalist George Stephanopoulos. She married actor/director Clark Gregg on July 21, 2001. They have a daughter Stella, born December 3, 2001. They live in Venice, California. The couple co-starred in the Lifetime movie The Road to Christmas in 2006. Prior to her 2010 appearances on Dancing with the Stars, Grey had a physical examination to ensure that she was fit enough to compete and saw a doctor to address chronic neck problems caused by the car accident years before. Her spinal cord was compressed and her surgeon placed a titanium plate in her neck to stabilize it. He also found a suspicious white spot on her thyroid via MRI. The nodule was cancerous and was removed. Grey has stated she believes the cancer was caught before it metastasized and that she is now cancer-free. In January 2017, Grey participated in the Los Angeles 2017 Women's March. ABC Afterschool Special Carol Durate Episode: "The Great Love Experiment"
1985 Laura Eller Episode: "Cindy Eller: A Modern Fairy Tale"
1986 The Equalizer Valerie Jacobs Episode: "A Community of Civilized Men"
1995 Friends Mindy Episode: "The One with the Evil Orthodontist"
1995 Fallen Angels Ginger Allen Episode: "A Dime a Dance"
2009 The New Adventures of Old Christine Tracey Episode: "Love Means Never Having to Say You're Crazy"
2010 House Abbey Episode: "Unplanned Parenthood"
2016 Lip Sync Battle Herself Episode: "Clark Gregg vs. Hayley Atwell"
6 Paso Doble / "So What"
7 Tango / "Shut Up"
8 Quickstep / "Let's Face the Music and Dance"
Finals Paso Doble / "Habanera"
Freestyle / "Do You Love Me (Now That I Can Dance)"
Viennese Waltz / "These Arms of Mine"
^ Contrary to previous versions of this article, and some of the sources cited in it, Grey indicated in a February 8, 2012 tweet on her verified Twitter account that she does not have a middle name. ^ "Jennifer Grey Biography - Facts, Birthday, Life Story". Biography. Retrieved January 20, 2012. ^ "Jennifer Grey: Biography". TV Guide. Retrieved March 24, 2012. ^ Katz, Mickey. Papa, Play for Me: The Autobiography of Mickey Katz. Wesleyan. 2002. p. 154. Google Books. Retrieved May 24, 2012. ^ "Joel Grey's famous family line". Los Angeles Times. January 17, 2011. ^ "KATZ, MEYER MYRON - The Encyclopedia of Cleveland History". Case Western Reserve University. July 17, 1997. ^ "Joel Grey Biography (1932-)". Film Reference. Retrieved 2014-02-23. ^ Porter, Rick (October 12, 2010). "'Dancing With the Stars': Jennifer Grey rules again" Archived 2010-12-19 at the Wayback Machine. Zap2it. ^ "Tracy Pollan: Actress". People. Vol. 53. No. 18. May 8, 2000. Page 128. ^ a b Hutchings, David (September 14, 1987). "Jennifer Grey (Joel's Baby and Matthew Broderick's Lady) Turns Up the Heat in Dirty Dancing".People. Vol. 28. No. 11. September 14, 1987. ^ "Jennifer Grey Profile". SuperiorPics. Retrieved November 4, 2011. ^ "Ferris Buellers's Day Off". Box Office Mojo. ^ "Ferris Bueller's Day Off – Bueller Bueller Edition". Archived from the original on 2006-02-09. ^ Briscoe, Jake (2017-01-09). "What Happened to Matthew Broderick - News & Updates - The Gazette Review". The Gazette Review. Retrieved 2017-01-31. ^ "Ferris Bueller's Day Off". Rotten Tomatoes. ^ Salvatore, Rosanne (October 10, 2011). "'Dirty Dancing': Where Are They Now?". Daily News. ^ Serjeant, Jill (August 9, 2011). "Classic "Dirty Dancing" film to get Hollywood remake". Reuters. ^ Ward, Rachel (November 5, 2011). "Jennifer Grey: where has she been?". The Daily Telegraph. ^ Byrne, Bridget (March 21, 1999). "New Sitcom, New Nose, Same Old Jennifer Grey". The Washington Post. .
^ Hamilton, Kendall (March 22, 1999). "It's Like, Uh ... Jennifer Grey". Newsweek. pp. 73–74. ^ Huff, Richard (March 28, 1999). "Like, You Know... L.a. Has A Funny Bone, Too". Daily News. ^ DiNunno, Gina (July 29, 2010). "Jennifer Grey to Guest-Star on House". TV Guide. Retrieved May 27, 2014. ^ "Dancing With the Stars Sources Confirm Margaret Cho and Jennifer Grey — Guess Which One Gets Derek Hough". eonline.com. ^ Cooper, Jackie K. (September 19, 2011) "The Bling Ring Marks the Return of Jennifer Grey". The Huffington Post. ^ "Jennifer Grey joins the judges". BBC Blog. ^ Truitt, Brian (December 16, 2013). "Gordon-Levitt, Blunt head up 'The Wind Rises' U.S. cast". USA Today. ^ McElroy, Steven (2016-11-04). "Jennifer Grey Is Having the Time of Her Life". The New York Times. ISSN 0362-4331. Retrieved 2019-02-20. ^ N'Duka, Amanda; N'Duka, Amanda (2018-12-03). "Jamie Dornan, Jemima Kirke, Ben Mendelsohn Drama 'Untogether' Lands At Freestyle Digital". Deadline. Retrieved 2019-02-20. ^ Hoffmann, Bill (September 2, 2002). "Broderick's Guilt". New York Post. Archived from the original on 2011-07-26. ^ Isola, Laurie (September 22, 2010). "Jennifer Grey never recovered from Matthew Broderick car crash". San Francisco Chronicle. ^ Sheridan, Peter (September 25, 2010). "What became of Patrick's Dirty Dancing partner?". The Express. Scotland. pp. 36–37. ^ Tutelian, Louise (May 23, 2008). "Putting Out a 'Willkommen' Mat". The New York Times. "Escapes", Page 1. 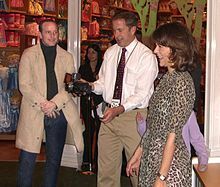 Mr. Grey's granddaughter Stella, age 6, lives nearby [Pacific Palisades] with her parents, Jennifer Grey and her husband, the actor Clark Gregg. ^ "Matthew Broderick - Matthew Broderick Car Crash Family Reach Out". contactmusic.com. ^ "How 'Dancing' Saved Jennifer Grey: Checkup Found Cancer". Good Morning America. ^ "Celebrities attend Women's Marches around the world". CBS. Retrieved 15 February 2017.